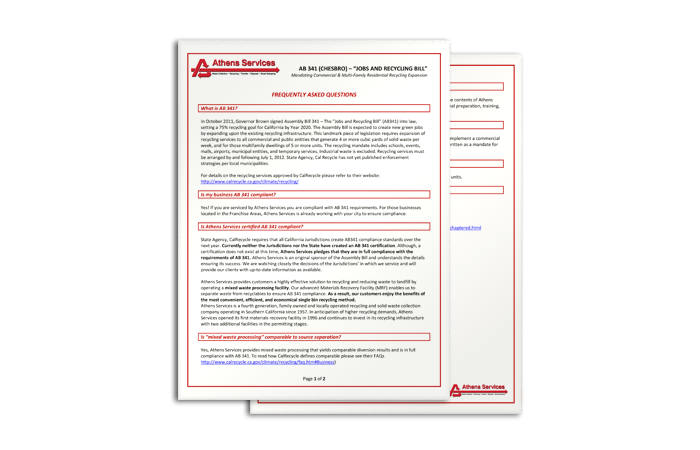 If you are an Athens Services customer, then YES – you are compliant with AB 341! * Athens Services is at the forefront of recycling, investing in the facilities and technology that improve our environment and prepare our communities for the future. In October 2011, Governor Jerry Brown signed Assembly Bill (AB) 341 into law, setting a 75% recycling goal for California by the year 2020. This landmark piece of legislation mandated that all California commercial or public entities that generate 4 or more cubic yards of solid waste per week, and multifamily dwellings of 5 or more units, must arrange recycling services. Jurisdictions determined compliance measures and due dates. The law required commercial waste generators to implement a recycling program, and all Athens customers have a compliant program. We make recycling convenient for our customers by utilizing a single bin. Our advanced Materials Recovery Facility (MRF) enables us to separate recyclables from waste to ensure AB 341 compliance. As a result, our customers enjoy the benefits of the most convenient, efficient, and economical single bin recycling method. To learn more about California’s Mandatory Recycling Law, visit the CalRecycle website. Thank you for your business and continued support as California moves toward a more sustainable environment. * Through separate recycling collection, the City of Los Angeles recycLA program meets the standards established by AB 341. However, the recycLA program does not allow recyclables to be mixed with waste. Therefore, each recycLA commercial and multi-family customer must implement separate recycling collection on their property to ensure AB 341 compliance and must utilize “recycling only” containers to meet recycLA program requirements.